NEWPORT, Ky. — To someone without artistic experience, the thought of designing a 300-foot mural in possibly the most viral spot on the Northern Kentucky riverside would be frightening. However, if you ask Rosalind Tallmadge, the designer and lead artist of the ArtWorks Cincinnati project known as #SharkWall currently underway at Newport Aquarium; she would tell you that it’s exciting. 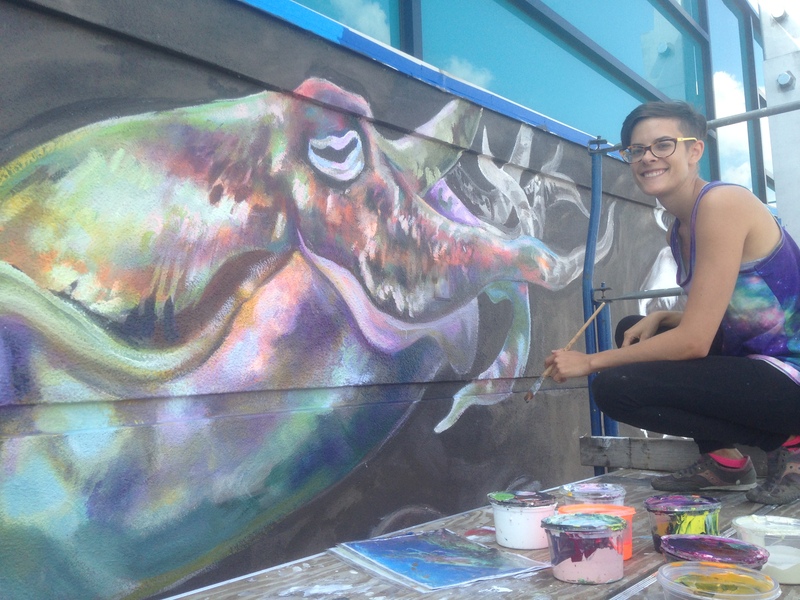 Tallmadge, who is currently in her eighth summer in collaboration with ArtWorks Cincinnati, which orchestrates urban art pieces all over Greater Cincinnati. 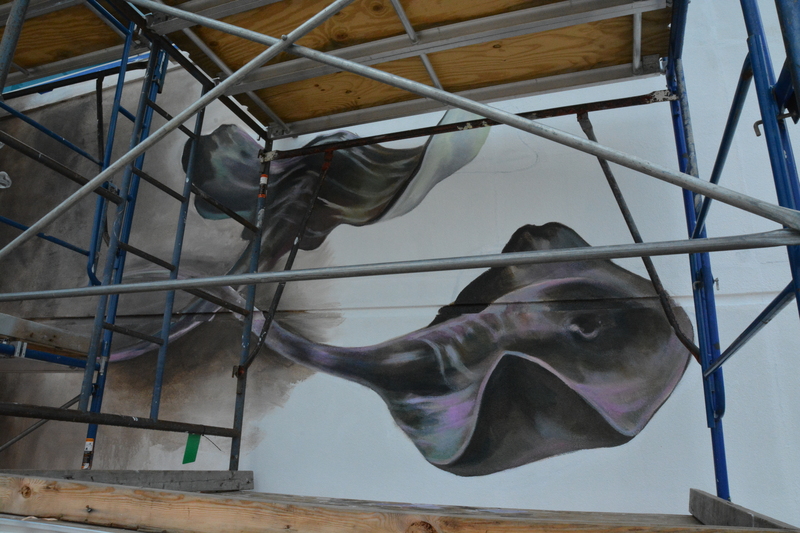 Tallmadge and her team of 12 apprentices are working feverishly on the mural that is projecting to be done by the second week of August. She received support from her apprentices and teaching assistants, such as Jenny Ustick, who Tallmadge lovingly calls her “partner in crime” in all things art. 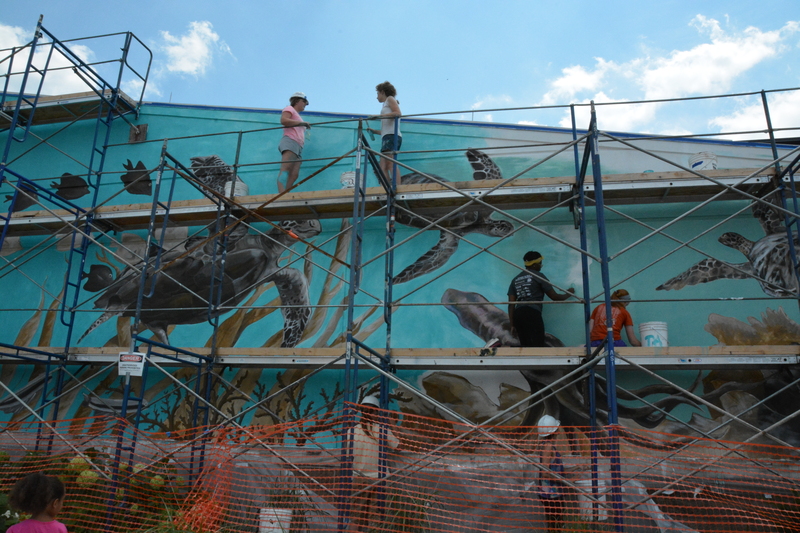 Together this is the third project they have worked on together, each mural getting larger then the last, with #SharkWall being the largest according to Tallmadge. With there being so many people working on the project at once, Tallmadge would tell you that working together is the key. “It’s definitely a team activity. No one has their own particular area they are working on. We try to just switch things up,” said Tallmadge, who added the team has really made a big difference to help keep progress moving quick. Tallmadge cites ArtWorks as the program that has really made things happen for the #SharkWall. She also cites ArtWorks as a great program for aspiring artists. Not only are the painting experiences at ArtWorks invaluable, the organization also has other programs to help young artists. Tallmadge knows well what they can do for artist apprentices; she has worked off and on with the organization since 2005 as a student, assistant and teacher. “It’s a really great professional opportunity and ArtWorks teaches resume and portfolio building in workshops for students, ” said Tallmadge, citing that as a perk of being a part of ArtWorks. Tallmadge also says that a great thing about ArtWorks is that the organization helps artists break the mold of what most think the stereotypical artists is to society. This entry was posted in #SharkWall by NewportAquarium. Bookmark the permalink.